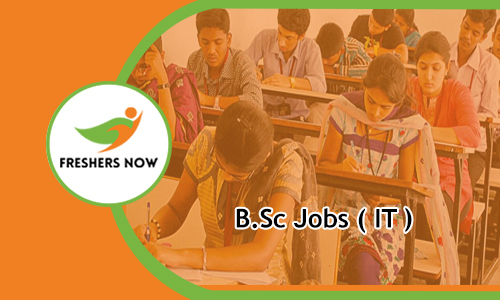 In this article, we are providing the latest B.Sc Jobs 2019. Candidates who are hunting for the IT Jobs after completing the B.Sc course check the updates regarding the Job vacancies for B.Sc graduates from this page. We are here to help both the freshers and experienced aspirants by providing the B.Sc Job Opportunities. the candidates who had completed their B.Sc can apply for the various jobs in the various sectors- like Agriculture Industry, Testing Laboratories, Wastewater Plants, Aquariums, Environmental Management and Pharmaceuticals and Biotechnology Industry, Conservation, Food Institutes, Health Care Providers, Industrial Laboratories, Educational Institutes, Chemical Industry, Space Research Institutes, Forensic Crime Research, Hospitals, Seed and Nursery Companies, Wildlife and Fishery Departments. Candidates can check this page completely for the B.Sc vacancies 2019. Candidates who completed their B.Sc and searching for the Jobs in IT Sector can check them through this post. All you have to do is check this post, daily and you can find all the Latest B.Sc Job Notifications. A huge number of jobs available for the B.Sc completed candidates for the year 2019. The aspirants can apply for various posts like Assistant Manager, Business Development Executive, Digital Marketing Trainee, L1 Support Engineer, Subject Matter Expert, Financial Advisor, Relationship Manager, Market Research Analyst, Technical Architect, Office Assistant, JR Recruiter, Customer Care Executives, Concept Creators, Staff Nurse, Test Lead and some other vacancies. The various companies which are located in popular cities like Mumbai, Chennai, Bangalore, Hyderabad, Pune, Noida, Kolkata etc will try to hire the aspirants through the Walkin Drives. We update the latest information about the jobs of various MNC and Startup companies when they announce the job openings. So our advice to the candidates is not to miss these latest B.Sc Job Opportunites. B.Sc is commonly known as Bachelor of Science. This is one of the most popular academic course among the science students after class 12th. B.Sc is an undergraduate academic degree award for candidates who completed courses within last three to five years from any university in India. Bachelor of Science offers Theoretical as well as practical knowledge about different subject areas. This course comprises of subjects like PCM, Physics, Chemistry, Maths, Zoology, Statistics, Botany, Forestry, Aquaculture, Aviation, Animation, Bioinformatics, Computer Science, Biochemistry, Dietetics, Electronic, Fashion Technology, Food Technology, Forensic Science, Home Science and more. B.Sc IT is a program related to Information Technology field. Candidates who are anxious about the B.Sc job opportunities can read this article completely without any confusion. Bachelor of Science degree is awarded for the study in the field of computer databases, networking, software development, software testing, software engineering, programming, web design, and computer systems. Apart from the IT jobs, candidates can go for the jobs in Research, Marketing, Business and other technical filed. These job openings are helpful to enhance their career. Nowadays there is high competition for the Information Technology (IT) jobs. Job fighters are unaware of the various B.Sc Jobs 2019. So to help them and to guide them in the right manner we have created this page. In this page, we are providing the latest B.Sc level jobs. The aspirants can choose a job according to their interest and qualification. If he/ she is suitable for the job openings the can proceed to apply. The B.Sc candidates can also go to the Off Campus drives. After completing the graduation in B.Sc all the passed out from various universities and colleges are hunting for the job. To reduce the unemployment many of the Multinational Companies and Startup companies are offering multiple job opportunities for the aspirants. Apart from the IT Sector, the B.Sc graduates can go for the jobs in the Government sector such as Railways, Defence, Lecturer, Banking, Agriculture etc. At present many of the IT companies are offering the vast number of job openings for the female aspirants. This is the right place to get the job vacancies for the B.Sc graduates. So we suggest the aspirants be in touch with this page for the current vacancies. In this article, the candidates can check the latest B.Sc Jobs 2019. Contenders are surfing the internet for the various job openings. To reduce the search burden of the aspirants we are providing the Jobs for B.Sc candidates. The aspirants who want to apply for any of the company as listed on this page can use the apply link. Before that, the candidates have to check the eligibility criteria such as education qualification, age limit, selection process, salary details etc. If you are eligible enough for the job can apply in the online mode by filling the application form. The aspirants have to apply before the last date to go attend the interview. To crack the job the aspirants have to prepare by using the syllabus, placement papers, interview questions by referring from our website. We hope the candidates find out the right corner to get the latest B.Sc job openings. Generally, the aspirants prefer the jobs at the near location where they reside. On our website Freshers Now, the candidates can find the employment opportunities according to the location. This might help the candidate to save the hassle time in searching for the B.Sc Jobs 2019 by location wise. If any of the contenders is not with the B.Sc qualification can go for the other qualification jobs which we have updated on our website. Along with the IT jobs, the candidates can find the Government jobs on our web portal. Candidates can visit our website for the latest job information. Or can bookmark this page for instant B.Sc job updates.